Today I was going to tell you about Step Two of the “9 Steps to get from fearful to fabulous series, ” but instead, I want to tell you a story about finding the perfect Christmas tree…because it is an example of Step One: Set Your Intention, that we discussed in my last article. Step One is about the Power of Intention – the power of knowing what you want and why you want it before you take action. It’s also about finding those things that bring joy to our lives. Since I was a little girl, the live Christmas tree has been the one symbol of the holiday season that I could count on. As an adult, as soon as I added a string of lights, even before handing the ornaments, I knew I could put on my favorite music, sit peacefully, and get a little bit lost in beauty and tranquility. One year, my ex, who was a worried about the “fire hazard” of a live tree, persuaded me to agree to a potted pine – I think it was called Norfolk. It was about four feet tall, and a bright green that reminded me more of a lime lollipop than a Christmas tree. When we got it home, and put it into the traditional corner, I burst into tears. He relented and we exchanged the potted disaster for the real thing. I was happy. After decades of living in a house, I now live in a one-bedroom apartment that I love. It’s perfect for me at this stage in my life, freeing me from the responsibilities of home-ownership so I can focus on my business and my relationships. But the one thing I miss is the room for a really full Christmas tree. Last year, my first in the apartment, I went to Whole Foods for a tabletop tree, and it was lovely. I stood it on a sturdy end table, added the lights, and enjoyed several weeks of my traditional living room joy. This year, the tabletop trees at Whole foods were smaller – shorter and narrower. I selected the biggest one I could find and brought it home, but every time I looked at it, I felt sad, like something very important was missing. But instead I decided to honor this one pleasure that I’ve enjoyed every year since childhood. I set the intention to find the perfect Christmas tree for my apartment. 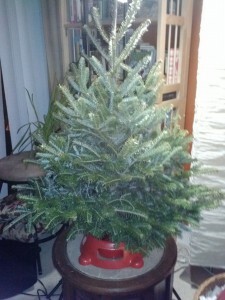 First I returned the too-small tree (thank you Whole Foods!). Then I sat in my car and asked for guidance…where will I find my tree? I pictured the perfect one…about three feet tall and full. And I waited. Then I remembered that a friend had told me that Ginko’s Garden on Capitol Hill had some lovely trees. So I called them, told my story, and asked if they had any really full trees about three feet tall. A very kind man offered to check, and came back to the phone excited. He had two left! It was 5 PM on a rainy Tuesday, as I sat in front of the Whole Foods in Foggy Bottom. I contemplated the trip across town during rush hour, and decided it was worth it. 4.1 miles and 45 minutes later, I stood in the rain and smiled as I gazed on the perfect tree – round and plump and three feet tall. My heart filled with joy and I thanked the Universe for growing this tree just for me! 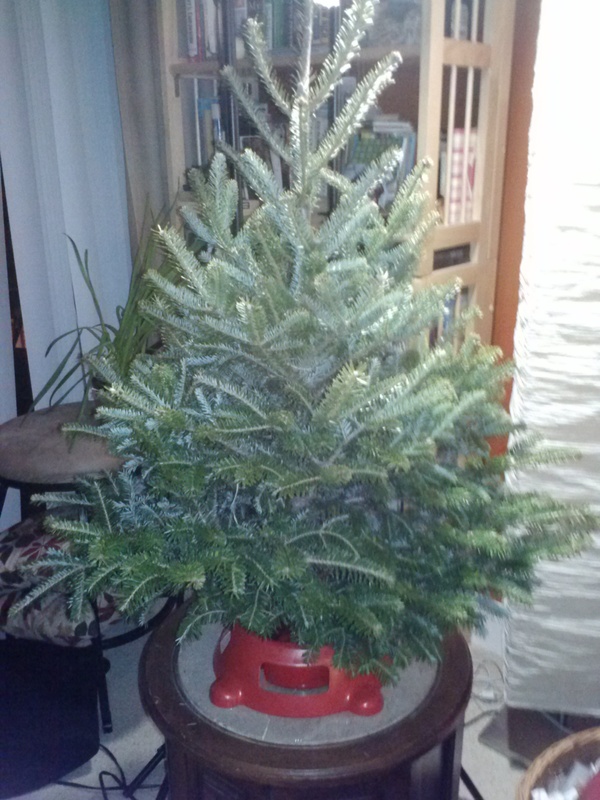 Now my tree sits on the same end table as the too-small one from Whole Foods. Every time I look at it, I smile. I can’t wait for my great grandbabies, Aryana and Maliek (ages 4 and 3) to come this weekend and help me to decorate, selecting from among the ornaments that I’ve treasured for years. I feel deeply happy. So I’m really glad that I decided to honor my desire for the perfect Christmas tree…one that stirs joy in my heart every time I look at it. I’m glad I know about the Power of Intention as a way to help us achieve what we want. And I invite you to notice what relatively small things stir joy in your heart…and set the intention to honor and savor those things throughout your day. Much love and many blessings to you and yours this holiday season! YOU are so right on Terri in this story. To honor an intention and then sit quietly, in as much emptiness as we can create and LISTEN. AND of course…FOLLOW! I feel the pleasure in your story…thank you.